Kyte Learning is a large library of video-based professional development courses and tutorials that provide teachers with on-demand technology training and support around various technology topics and tools. Courses available within the Kyte Learning platform are authored and created by submitting educators and content is vetted and approved by Kyte Learning. Courses can take anywhere from 30 minutes to 2 hours to complete, and each is composed of several lessons broken down into related videos. 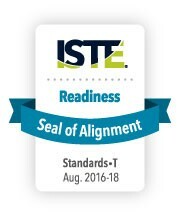 Kyte Learning’s Course Library successfully underwent the International Society for Technology in Education (ISTE) Seal of Alignment review for Readiness. Reviewers determined that this library of courses, provides teachers foundational information on how to use a variety of technology tools and platforms, and can help build strong foundational skills needed to support the ISTE Standards for Teachers. "The Kyte Learning library is current, interesting, and immediately useful to classroom teachers at any grade level. Each course is full of short, easy to follow training videos for a wide variety of programs and offer a valuable opportunity for teachers to begin to grow in their application of technology." 1.a. Promote, support, and model creative and innovative thinking and inventiveness. This resource helps build foundational technology skills needed to support the ISTE Standards for Teachers.